Andtc had an absolute blast at the Saint NDT conference! The Saint conference was held on the 7th and 8th of February and had something for everyone. There were exhibitions from all over and of course we joined them by showing off the awesome things our training centre has to offer. Anything from discounted training courses to competitions to the live phased array of fish! There was also a call to present research papers at the conference and we jumped at the opportunity. 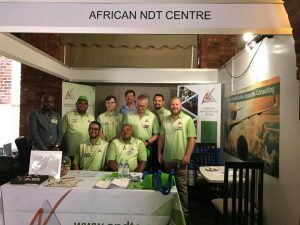 In total African NDT centre presented 4 papers and had a blast while doing it. We had some Competitions for all to take part in, the prizes were big so we decided to have people compete with their actual NDT skills. Mr Ivan le Roux won a RT level 3 course by interpreting the most RT films correctly in the shortest time. All in all the Conference was a huge success and a great time was had by all who attended. Looking forward to the next one SAINT.